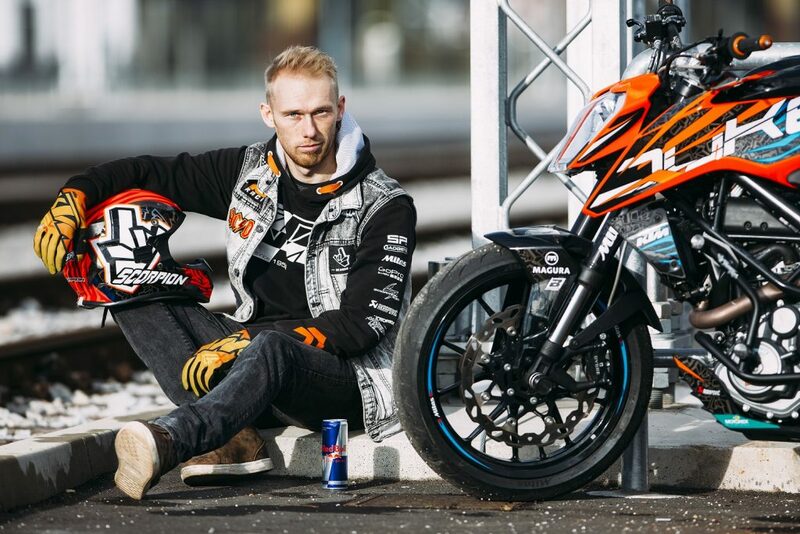 Freestyle stunt rider, Rok Bagoroš, began his professional career in 2011 with the KTM 125 DUKE. Since then, he’s performed around the world on every single cylinder DUKE in the range. KTM BLOG caught up with the Slovenian rider to see what he thinks to the recently updated KTM 125 DUKE, KTM 250 DUKE and KTM 390 DUKE and to ask him what he loves about the new generation and what made the previous models so good for stunting. Rok Bagoroš is a man always on the go. If it isn’t him performing gravity-defying tricks on a range of KTM DUKEs at events, then he is dreaming up new tricks, the content of his next video or the designs for his new range of clothing. He’s a hard worker, no doubting that. The beginning of Rok’s professional career coincided with the launch of the KTM 125 DUKE and together they showed the world their abilities. When the KTM 690 DUKE was massively updated for 2012, Rok helped wheelie it into the face (not literally) of riders. The same happened with the introduction of the KTM 200 DUKE and then again with the KTM 390 DUKE. He is the only stunt rider among the world’s elite using a single-cylinder engine motorcycle. He’s also fresh back from Nepal after performing the world’s highest stunt show in the Himalayas. So, in terms of extreme riding with DUKEs from 125cc to 690cc, there’s no better experienced man than to talk to us about the DUKEs past, present and future. Before the action with the journalists went down, we took the time with Rok to check out his new Moto Garaža where he and his team prepare the stunt bikes, creates special parts, service motorcycles from the local area and sell his official merchandise. And he’s right. When we rode with Rok the previous day to check the test routes and sight the photo points, it was like being in the middle of a KTM promo video. Every stop sign was an opportunity to test the brakes with a rolling stoppie and each green light chance to launch a wheelie. Worth noting, Rok did ride in this KTM 125 DUKE promo video. Anyway, after seven years riding KTM single cylinders – rarely with both wheels on the floor – we asked Rok about the DUKE range; past, present and near future. “The bike I started my pro career with. When I first saw it, I didn’t know how to use the clutch! I came from scooter stunt riding, so it took me a couple of weeks to learn this funny lever! Not much later I got my first wheelie using the clutch and then the other tricks soon followed. The transformation from automatic to manual was quite quick! I used the KTM 125 DUKE for two years and people’s minds were blown that I could do wheelies, drifts, burnouts and technical stuff with this small capacity bike. But for me it was easy. For a 125, it has a lot of power. As soon as you put a bigger sprocket on the rear, it is a great base for a stunt bike; it’s a solid machine and you can’t destroy it quickly. It came ready with good equipment, such as the brakes and suspension. A lot of competitor 125cc bikes have slim forks that would soon be bent like a banana with how I ride. “This was when the 690 moved away from its supermoto styling and became more of a naked roadster, like the 125. It was a huge step for me to go from the 125 to 690! Not just in terms of power, but also the weight – and both are light bikes! So, I had to bulk up; the back and core muscles for stunt riders are under a lot of stress. So, I trained hard. “KTM entered many new markets with the KTM 200 DUKE and, like I did with the KTM 125 DUKE, it allowed me to increase awareness for KTM in a lot of new countries. This bike is what really developed my name as a stunt rider and was my favorite KTM, up until now. It has enough power to do drifts but feels perfect when you do the really technical tricks, like wheelie circles, no-hand wheelie circles, combinations and so on. It’s so smooth. With helping KTM produce promotional videos and images for the new DUKEs and attending press launches and other such events, Rok has enjoyed plenty of saddle time on the new KTM 125 DUKE, KTM 250 DUKE and KTM 390 DUKE in standard trim – no special parts, other than KTM PowerParts! “Looks wise, the new bikes are once again on another level,” the 27-year old explains. “I was expecting a small update for last year, but it was a brand-new bike – frame, plastics, tank, headlight. It’s like nothing compared to the previous bikes. I love the sharp edges and how it looks like the KTM 1290 SUPER DUKE R.
“This is a huge change. I’m not saying that because I’m a KTM factory rider. The suspension is a BIG jump in performance. Before, my feeling was that it was too soft. But now it has a great feeling and stability for high speed stoppies and kangaroo stoppies. Also, the shock absorber is much better – this is next level equipment. “I love the 250 – it’s the closest to the 200 in terms of the engine. I really got to know this bike in 2017 as I did a lot of shows with it around the world. Even more crazy, I just used it in Nepal to perform the highest stunt show ever recorded at 3664 meters. To get the record I needed to do a 20-minute show. “I love doing stoppies. This bike has a really powerful front brake and this gives me the ability to do some great stoppies. The sintered brake pads bite hard; you can hear and feel this and I love it. The suspension is the same next level jump as with the 125. For sure, it is firmer than the smaller bike and worked really well on all the crazy roads I rode on in Turin at the launch last year – from over the tram lines in the city to the fast sweepers in the mountains. While Rok waits for confirmation from Guinness World Records to see if his Himalayan show made it into the record books, we don’t doubt that he isn’t already making plans for his next extreme adventure. Rok on!